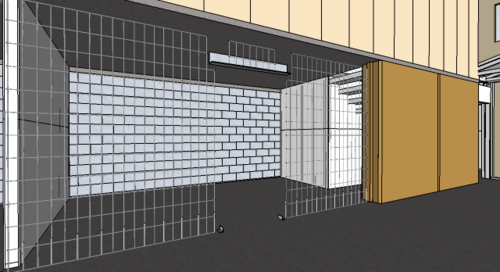 A little more work in Sketchup tonight to detail the type, size and placement of the reo mesh inside the rammed earth walls. As usual I’m glad I’ve done this work, because I’ve picked up (yet again) a couple of little gotcha’s which would have made the earth ramming a little challenging in a couple of places. Case in point - without having placed the starter bars in the drawing before jumping in and doing them for real, I wouldn’t have realised that they will interfere with the placement of the end column forms. Since I’ll be leaving a gap between panels as I ram them (and filling in the gap without using the columns, bracing against the rammed section of walls), if I installed the starter bars in these gaps then I’d have nowhere to place the column on that side.